I just finished reading Tribe. At one hundred thirty five small sized pages, it is a quick and entertaining read. I think this book is relevant to divisive modern times. The main takeaway I received from this book is of the importance of “belongingness” to human beings. Modern humans are the result of our long evolution. For most of this evolution, we have existed in small tribes in which our survival was directly linked to being a member of a smoothly functioning and cooperative tribe. Modern life has changed all of that. We no longer need a tribe to physically survive. 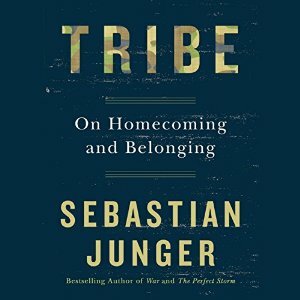 The problem is that while we may not “need” a tribe for survival, our well-being still requires this feeling of “belongingness”. Throughout the book, Mr. Junger provides examples of how belongingness benefits people even when their circumstances are grim due to warfare, natural disasters, and more. In fact, in many cases it is the very existence of these adverse circumstances that created the tribal bonds. In my opinion, many of political/social/special interest groups have become the default “tribe” for those people lacking this feeling of belongingness. The unfortunate result is many people whose very identity is bound to increasingly radicalized tribal views. At this point, the benefits of the tribe are far outweighed by its many disadvantages to both the tribe members and society at large.